Three massive blazes are forcing thousands of Californians up and down the coast to flee from their homes. 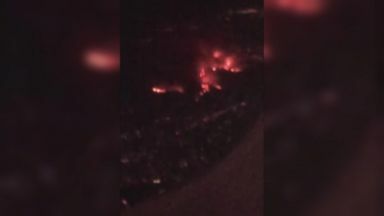 "Nightline" takes a look at why these fires are becoming more common - and more deadly. Reporter: For the Chatfield family, all they could do was pray. Please help us to be safe. 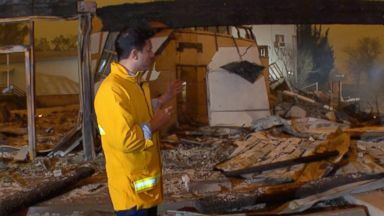 I'm thankful for Jeremy and his willingness to be brave -- Reporter: As they sped through flames chewing through their northern California neighborhood, so many following their path. Move, people. All those homes gone. I feel the heat. Go, go, go, go. We're not going to catch on fire, okay? Reporter: They escaped in time, but others in the town of paradise would not. Southbound from feather river hospital on pence is all blocked by fire. Reporter: Nurse Tamara Ferguson. Trapped at work, she posted this terrifying video, along with a good-bye letter, writing, to all my friends and family, especially John and my kids, I love you with all my heart, I am trapped in this horrific fire and can't get out. Any units, feather river hospital, we've got four people trapped in the basement. Reporter: Police arrived right on time, rescuing her and the others trapped in that basement. I'm so scared. Reporter: This hellish nightmare began Thursday, quickly gaining momentum, and now an entire town has been reduced to ashes. This fire is now the fourth most destructive in California's history. We lost everything. Trailers, all our belongings. Now we're on grinding rock, just trying to save everybody else's stuff. Reporter: Today officials announcing their worst fears, nine residents here did not make it. Some of their bodies found in cars after being overtaken by flames. That number could climb given that conditions are still too unstable for firefighters to conduct door-to-door searches. The mayor of the city, Jody Jones, urging residents to not surrender. I don't know what we're going to be faced with in the next few days, but we will rise from the ashes, so to speak, we will rebuild, and we'll be better than ever. Oh my god, the tree's burning right next to us, oh geez. Reporter: The fire in paradise one of over a dozen active fires burning across the state. Oh my god. Reporter: As of tonight, over 100,000 acres in flames and over 150,000 people evacuated across the state. Down in southern California, two major wildfires. The hill fire, and the woolsey fire, just miles from one another. A third fire threatening landmarks, coming within miles of the Los Angeles zoo. Closed for the day as officials put some of the smaller animals in cages and evacuated them. Some landmarks like the historic paramount ranch studios, housing the set used in productions like "West world," destroyed. Also today the famed bachelor house in the fire's path. Flames reaching celebrity-fill neighborhoods. Among those forced to flee, Kim Kardashian west. They're evacuating everyone right now from all of our homes. Reporter: In malibu, Caitlyn Jenner telling fans on Instagram she's safe. Don't know if the house made it or not. Reporter: The woolsey fire reaching the home featured in her reality show "I am Cait." Hey, baby. Reporter: Firefighters combat flames in hand to hose, house to house-combat across the once-idyllic mall due canyon. Local officials in the area called today for all residents to evacuate immediately. The devastation here, you can see it. This home was fully engulfed, now it's starting to collapse. This is what firefighters are up against. We've heard explosions from inside this house and I think we're going to move down the street to a little bit of safety here. California's become a 365-day season except for rainy days. Then that presents problems too based on the fire and the fuel and possible debris flows after that. Almost like when there's a fire, there's a super-fire. We have a lot of structures here. We have a lot to get consumed, a lot of acreage. Three people trapped in a house -- Reporter: We met Ashley Snodgrass minutes after she and her boyfriend escaped their home. We were watching it all night with December messages, we method it wouldn't come this far, and it happened so fast. Reporter: She has all she needs, she says, her boyfriend and three dogs. There's nothing they can do. You think your house are on fire now? Yes. Reporter: Calabasas resident Adrian documenting the fire's March to her front door. It's almost 5:30 in the morning. This is the side of my house which is pretty much almost gone. This is crazy. I don't even know what to say right now. But the firefighters saved my home. And I am so grateful. But my whole neighborhood is gone. Reporter: And in the neighborhood of Thousand Oaks, the fire is compounding the anguish of a community still reeling from Wednesday's mass shooting. In a surreal moment, a reunification center for mourning families quickly turned into an evacuation center as the fire began consuming the area. There is no panic at the hotel here in Ventura county. You can see there's exits. Our hotel is under a mandatory evacuation. You see the lobby full of people. People are absolutely panicked. They have their pets, they've been evacuated from their homes. Reporter: Glen McDonald, a wildfire and climate change expert at UCLA, forced to evacuate his own home in Thousand Oaks today. I am unbelievably anxious right now. Unbelievably anxious. And even though I talk about this a lot, I have to tell you, when you're actually in the middle of it, it's a different animal. Reporter: The scientist coming face-to-face with the brutal reality behind his research. As we drove away from our home, there's this feeling of imminent loss. You look in that rear-view mirror, you see that red sky, you know that that fire is on the ridgeline immediately behind your home. I've written about it, I've studied it. You have to be there to understand how anxious that is. Reporter: McDonald says fires like this are fast becoming California's new Normal. Here on the coast, particularly in southern California, we're going for the year-round fire season now. Look at the 21st century. 15 of our 20 largest wildfires have occurred since the year 2000. This isn't a one-off, this is part of a pattern. Reporter: 2017 was among the most destructive years on record for California wildfires, with more than 9,000 fires burning 1.2 million acres, according to Cal fire. So far, 2018 is shaping up to be even worse, with more than 1.3 million acres already burned. Based on where we're going with temperatures because of increasing greenhouse gases, we're going to have drier and drier Summers. I can't see the situation getting better. If anything, it's getting worse. Studies suggest by the year 2100, the state will see a 77% increase in wild land fires. We're not on a good trajectory and we can already trace that. Reporter: In addition to climate change, McDonald says California's fires are worse because people are building more homes in fire-prone areas. It's the way we've configured our cities. Almost anywhere you're going to develop, particularly in southern California, you're going to be adjacent to flammable fuels. If you're living here, even if you're in a suburb like that, you've got to have a fire evacuation plan. You've got to know what you're going to do, where you're going to go, what you're going to take with you. You can't fool around here. Reporter: Tonight the battle rages on as first responders continue working around the clock to save whatever they can. For "Nightline," I'm Clayton Sandell in Thousand Oaks, California. 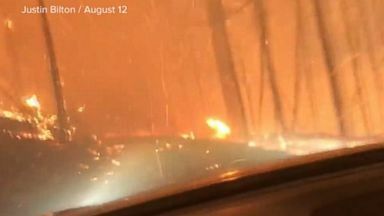 Dramatic footage shows a father and son making a daring escape from a growing wildfire in Montana's Glacier National Park. 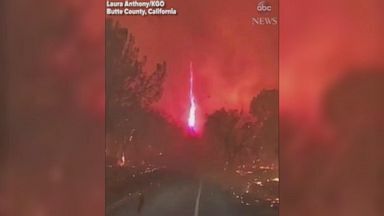 Towering "firenado" seen swirling amid the Camp Fire that has scorched at least 20,000 acres in Northern California.